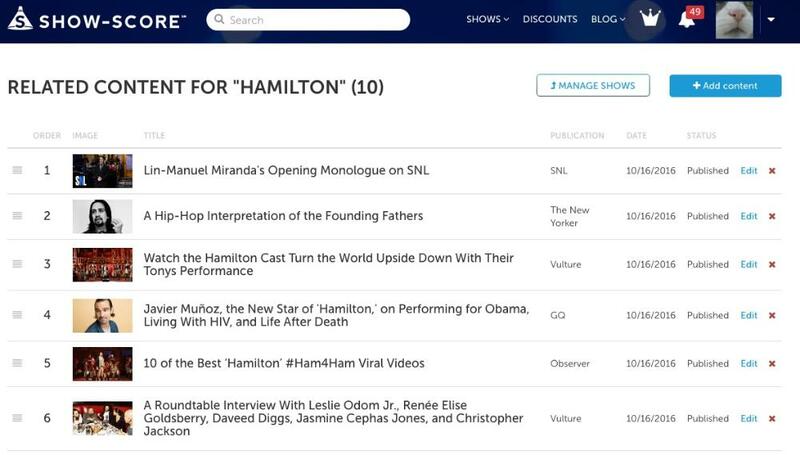 Related Content is a powerful way to help audiences decide if they are interested in your show. It's free, self-serve, and easy to use. 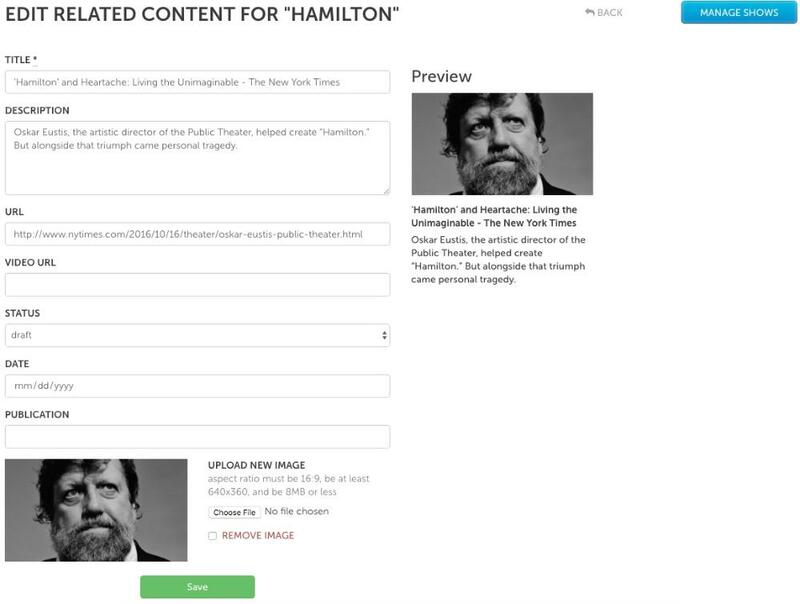 Related Content can include feature articles, talk backs, TV ads, music videos, Q&As, or anything else that might help audiences decide if the show is something they might like. There is no limit to the number of items of Related Content. The display order of the items can be easily changed. Who can post Related Content? 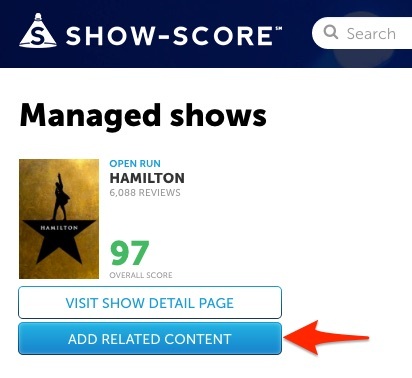 Related Content can be posted by Show-Score staff members, or validated representatives from the show (such as publicists, social media managers, agencies, general managers, artists, producers, etc). In order to post Related Content, a show representative needs to send an email to help@show-score.com. The email should include the show name and the full name and email address for each person who should given permission to post Related Content for that show. 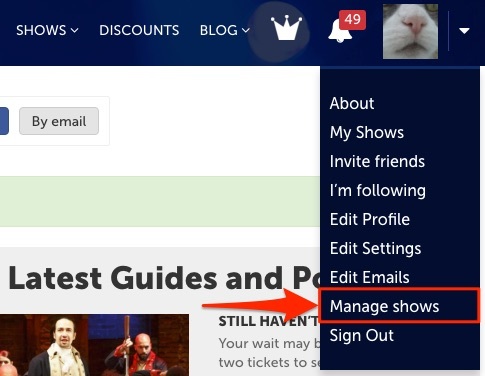 Every person needs to already be a Show-Score member (which is free). A given show can have multiple people with permission to post Related Content. We will send confirmation emails to the requester and each person who has been given permission. Please allow several days for processing. The same person can have permission to post Related Content for multiple shows. This is especially useful for agencies or publicists who support multiple shows. How do I post Related Content? You need permission to post Related Content. See the section above ("Who can post Related Content?") for details. Change the order of the items by dragging the far left "hamburger" icon (the gray symbol with four horizontal lines). You can drag it up or down. Use "Article URL" for any piece of content that is NOT a standalone video, such as a newspaper article, a Facebook post, and link to the show's site, a podcast, etc. If any of those pieces of content have a video inside, still use the "Article URL" box. Use the "Video URL" for videos that are hosted on YouTube or Vimeo. The "date" field should be either the date you posted the Related Content, or the date on which it was originally created. We recommend the latter. The "status" field should be "draft" until you are ready to publish it. To actually publish the article, change the "status" from "draft" to "published" and then click the green "Save" button. After you publish the article, you can see how it looks. If you don't like it and want to make changes, change the status back to "draft" so the content is no longer publicly visible. The "publication" field is blank by default, but should ideally be filled in. At the bottom, you can replace the thumbnail image that was automatically uploaded with an image of your choice. Please follow the stated guidelines related to size. By this point, you should have been able to import your first piece of Related Content! Please note: critic reviews will be represented in the Reviews section of your show page and should not also be added as Related Content. If you run into any problems along the way or have any questions, please email help@show-score.com.